Hey gang, we have another special guest reviewer this week! While I take on Optic Nerve and BPRD: Vampire, our pal Sal Lucci reviews Planet of the Apes: Spectacular, as well as the end of Grant Morrison’s Bat swan song in Batman Incorporated #13. So hang in there, True Believers, as we delve into another edition of this week’s All New, All Different Last Week’s Comics. I’m very particular about my Batman. The more serious the story, the more stoic the man, the more I like it. Characters should be drawn as realistically as possible; shadows should drape and darken every horizon. I don’t usually go for campiness, time traveling, supernatural beings or garish costumes. This explains why I was hesitant when I initially saw the Batman Incorporated title. I hadn’t read a new comic in many years, but some friends said if I liked Batman as much as I claimed to like Batman, I should check out what Grant Morrison was doing with the character. As soon as I jumped into Morrison’s saga, I was with him for the ride. His understanding of the entire history of Batman and willingness to call up the minutest detail to incorporate into the central tale is astonishing. I really came to appreciate how artist Chris Burnham’s cartoonish style meshed with Morrison’s dark storytelling. To say I’ve been eagerly anticipating this particular issue is an understatement. The delays, the worthlessness of issue 11, even the mention of Zero Year (not necessary in this book!) was all worth it. I took an early lunch to get to my local shop as soon as it opened and decided I couldn’t wait until getting home after work to read the issue. I knew I would never get a chance to read and really process it in my office, so I sat in my car trying not to absorb every detail yet not blow through the issue. Reading Morrison’s finale of his seven-year Batverse run brings to mind Neil Gaiman’s Whatever Happened to the Caped Crusader? (Batman #686 and Detective Comics #853), particularly Gaiman’s focus on the cyclical nature of Batman (like the Ouroboros featured so prominently throughout Batman Incorporated.) Batman is destined to constantly be reborn, no matter the consequences (“Do you know the only reward you get for being Batman? You get to be Batman,” the spirit of Martha Wayne tells Bruce). But it’s only to suffer the same fate each life cycle, despite being told it’s OK for him to let go, that he has already won in some way. Reading Gaiman’s story, I felt that I would be okay if it was the final Batman story I would read. I got a similar feeling with Morrison’s ending. In my heart, I was expecting something drastic, considering how Morrison was allowed to stay outside of the New 52 canon. To the very end, I was hoping for a tie to the alt-future shown in earlier issues of Damian as Batman while Gotham burned (see issue #5). By the time we read this issue, Batman has survived his battle with Talia al Ghul, and Talia’s death at the hands of the returning Kathy Kane has already happened. So what I really want doesn’t matter, because everything happened already – a nice meta-touch. The story is told in flashback, largely narrated by Commissioner Gordon and further revealed through a conversation between Gordon and Bruce Wayne. Gordon even hints to readers that he knew all along that Wayne was Batman. Wayne claims that Batman is dead, but it doesn’t seem that Gordon or Wayne really believe this. Wayne doesn’t even make it inside his mansion before he’s back out on patrol. Damian’s and Talia’s bodies are missing from their graves. Going back to what I wish can happen: I wish for DC to leave this title here with this ending, to not continue it with another team. Batman may not have defeated Ra’s al Ghul, but neither did Ra’s defeat Batman. Let me have my ending, although I know that the Batman tale can never end. I’ve already seen an advertisement for a “special issue” of Batman Incorporated. It’s an all-too-rare joy seeing a new issue of Adrian Tomine’s anthology series, Optic Nerve, on the shelf. Tomine’s work is simultaneously subtle and biting but most of all, it is smart. I believe the last one came out almost two years ago, so a new issue always feels like the most pleasant and fulfilling of surprises. 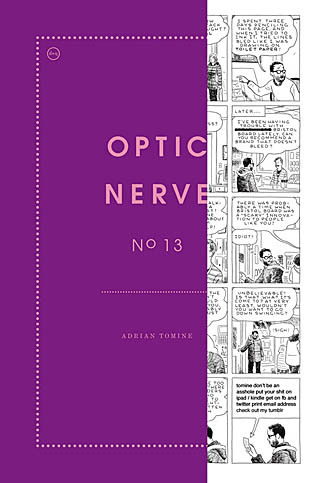 Optic Nerve #13 delivers. Comprised of three stories, the issue begins with an autobiographical tale, “Winter 2012.” Here, Tomine, ever the Luddite, laments the decrease in quality of a particular Bristol board and a particular pen. He’s been using both for years. The story is one page long and made up of twenty panels. Within that constricting limit, Tomine introduces his comics surrogate, his family, his attitude toward technology, winter in New York and so much more. There’s more character and plot in this single page than in some other books I read this week. Morally vague characters populate the issue’s second story, “Go Owls.” The story of an older man and a younger woman who meet at a 12-step program, “Go Owls” serves as the issue’s centerpiece. It is about two flawed people falling in love and their ensuing relationship. Tomine approaches the story from a single, straight-on perspective as if he’s observing them in a documentary. Broken up into mostly 12 panels per page, Tomine shows us the entirety of the protagonists’ relationship – from its dubious beginning, through its escalating abuse and claustrophobia and then right to its conclusion. 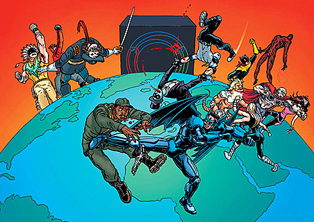 Characters walk in and out of panels, a change from sepia tone to a blue indicates the time of day and the characters pull further and further away from each other in every panel. Tomine never reveals the woman’s name in the story and only tells us the man’s name at the end, enhancing the story’s voyeuristic feel. It’s a meticulously crafted and designed tale that’s a brutally honest look at two people falling in and out of love. The only time the perspective changes is at the story’s end. The reader is given a moment to get out of this world, to breathe and then Tomine brings the reader right back. He’s not letting us go; he’s only letting us come up for air. The closing story, “Translated, from the Japanese,” is a thematic counterbalance to “Go Owls” in that it follows the story of a woman on the brink of a broken marriage, told through first-person perspective and as narrated to her unseen son. It’s a heartbreaking and honest work. Again, this is an honest, constructed tale. There is no melodrama. Tomine tells us just what this woman was going through while showing the reader the journey through her perspective. We never see the story’s primary characters. We only see the woman’s perspective. The only time the story leaves her perspective is during a flight of fancy, and even then, it’s a splash page of an airplane flying above the clouds – an everyday wonder. The story evokes so many questions with the last page. Optic Nerve #13 is an example of just how good a single-issue comic book can be. It’s a visual treat, even if it’s (at times) emotionally devastating. It should be available at finer comic shops everywhere, or from Drawn & Quarterly’s website. I like that Boom! Studios brought back Planet of the Apes, and they did so with a vengeance. Two successful miniseries (Betrayal of the Planet of the Apes and Exile on the Planet of the Apes) and a monthly ongoing book (Planet of the Apes). When the latter was canceled, Boom! gave us another ongoing monthly in Planet of the Apes: Cataclysm (in regrettable news, Cataclysm is being cut after next month’s 12th issue). Each story takes place at a different pivotal period in the Apes saga, but all still manage to remain true to the original film series’ continuity. It’s admittedly tough to keep all these Planet of the Apes arcs straight, but I think Boom! Studios has done the planet justice, and I hope to see their contributions included in future editions of the Planet of the Apes encyclopedia. July’s Planet of the Apes: Spectacular returns readers to the not-yet-completed tale from the company’s initial long-term book. In a series of terrible teases, Boom! Studios keeps dangling more story in front of fans, but releasing chapters in only dribs and drabs. When this promising series was cut after 16 issues in July of 2012, an Annual followed the next month, a Special picked up the story in February of 2013 and Spectacular didn’t hit shelves until July of 2013. I don’t really follow the numbers end of the comic book business, but if two attempts at long-term stories are suddenly cut, something tells me the books aren’t selling. It’s unfortunate, as I looked forward to Planet of the Apes as much as my various “big two” titles each month. 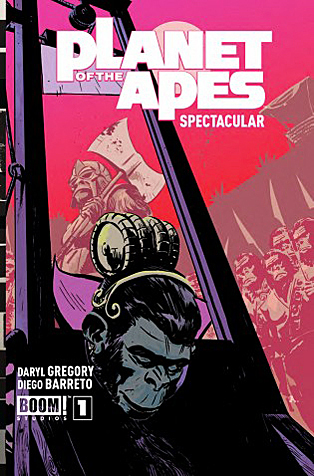 The stories are tight and the action tense (Daryl Gregory remains principle author throughout) and the art and colors are truly representative of the Apes universe (Darrin Moore remains on colors while art switched from Carlos Magno to Diego Barreto with Special). Spectacular does its part in working towards wrapping up the initial storyline (Sully’s human army has taken the city of Mak, but unbeknownst to them, the Golden are coming; meanwhile, Brother Kale holds sway over Sully’s young son, Julian – the first human to be born mute). But releasing chapters seemingly at random only adds to my confusion and disjointedness. I had to go back to Annual and Special to get into the groove since I couldn’t remember who some characters were or even where the story left off. I would prefer Boom! to finish the story in one shot, as readers definitely shouldn’t be left hanging at this point, but I’m clearly not going to get that. Pick up Spectacular if you want to finish the tale, but don’t look at it as a jumping-on point. I think most, if not all, of the original 16 issues are available in affordable trades, so start there. That’s what I kept asking myself as I started reading BPRD: Vampire #5. The short answer is, pretty damn far and he has plenty more to go. The first issue of the series began with BPRD founder, Professor Trevor “Broom” Bruttenholm, sending the cursed agent, Simon Anders, to the small Czech town of Ceský Krumlov. There, Anders hunts down the vampire clan that cursed him and finds much more than he bargained for. Following last month’s issue, Anders has succumbed to vampirism and has slain a village full of witches. Bruttenholm now has to assess the damage and see what kind of monster he’s unleashed on the world. I could read Mike Mignola, Gabriel Ba and Fabio Moon horror yarns forever. They balance weird fiction and horror while developing their characters. The Broom we see on page one hangs his head. He’s unsure of what to do about this predicament and he’s wary of leaving baby Hellboy alone. Whereas the Broom we see on page 22 has his head held up high and is ready to send his agents on a new mission (one that just may involve vampires). While it’s Broom we see most of the issue, this is Anders’ story. Anders, who was frustrated the whole series, once hiding in the shadows, hunting vampires and witches, now stands assured with a clear purpose – more. Now that I think about it, I think this issue is the only time we’ve seen him smile this whole series and it is damn chilling. Throughout the issue, Ba and Moon subtly build and change Broom and Anders. Broom becomes more confident, standing against the things that go bump in the night while Anders, who once slouched a bit, stands proud and revels in his dark power. 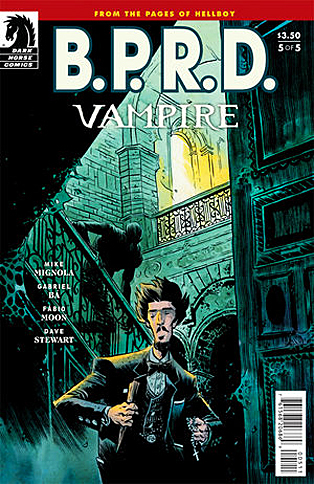 Ba and Moon bring the same storytelling chops to this vampire tale that they do to more personal works like De: Tales and Daytripper. The panel layouts drive Broom and Anders throughout the castle until one stands in light and one stands in darkness. However, this is a BPRD comic and the symbolism is never that easy. No, Anders is no longer the merchant marine Broom met in 1947. Now, he is a monster that wants nothing else but to drink more vampire blood. In a book that features a blood-spattered village, vampires and an academic monster hunter, one would think there wasn’t much room to get even weirder. Oh, how very wrong that person would be. There is a scene in this comic that has baffled me and makes me dread the next time Ba and Moon drop in for a visit to the BPRD. Anders, after making it very clear he has no interest in rejoining Broom, opens a door and all we see are what I think are Hecate’s spirit creatures. I have no idea where Anders is going, but Mignola, Ba and Moon delivered such a frightening tale that I’m almost afraid to find out. While Sal does not have a Twitter, Ian does. He’s had a hard time sleeping, lately. He’s plagued by visions of woodland creatures whispering one word: More.